Update 08/19/2014: patch 1.67 did not modify the resource in question, so the 1.63 packages fit with the patch as well. Update 01/16/2014: patch 1.66 does not modify the resource in question, so the 1.63 packages fit with the patch as well. Update 10/19/2013: I updated pre-made packages for patch 1.63. The tool still works for the patch. As always with a patch that changes the resource, remember to update the custom package you've created to fit with the new patch version 1.63. Update 09/04/2013: patch 1.57 does not modify the resource in question, so the 1.55 packages fit with the patch as well. Update 06/19/2013: I updated pre-made packages for patch 1.55. The tool still works for the patch. As always with a patch that changes the resource, remember to update the custom package you've created to fit with the new patch version 1.55. Update 02/20/2013: Updated tool to version 1.0.6 for patch 1.50 (the old version crashed on saving the file). Also updated pre-made packages for patch 1.50. As always with a patch that changes the resource, remember to update the custom package you've created to fit with the new patch version 1.50. Update 01/22/2013: Patch 1.48 does not modify the resource in question, so the 1.42 packages fit with the patch as well. Update 01/09/2013: Patch 1.47 does not modify the resource in question, so the 1.42 packages fit with the patch as well. Update 11/14/2012: Since EA has implemented turning off memories so that people have difficulties getting it to work, I updated the no memories version for 1.42 as well. Update 10/30/2012: Updated only important memories package for patch 1.42. The tool still works without modification, but you MUST create a new package when you patch. Update 09/27/2012: Patch 1.39 does not modify the resource in question, so the 1.38 packages fit with the patch as well. Update 09/01/2012: Updated tool to version 1.0.5 for patch 1.38 (the old version crashed). Also updated pre-made packages for patch 1.38. Update 07/09/2012: Patch 1.36 does not modify the resource in question, so the 1.31 packages fit with the patch as well. Update 06/04/2012: Patch 1.34 does not modify the resource in question, so the 1.31 packages fit with the patch as well. Update 03/16/2012: Patch 1.33 does not modify the resource in question, so the 1.31 packages fit with the patch as well. Update 03/09/2012: Patch 1.32 does not modify the resource in question, so the 1.31 packages fit with the patch as well. Update 03/02/2012: Updated both pre-made packages for patch 1.31. The latest version of the tool still works with this patch, so you can (and should!) use it to update your custom package for the patch. Update 11/03/2011: Fixed issue with the "Teach $pet hunting skill" memory. Thanks CatCreature for the report! This affects both pre-made packages and the program to create your own mod. Only this one memory was affected by the issue. Update 10/23/2011: Updated the "Only important memories" package (redownload it; this time I haven't created a separate download to avoid confusion). I haven't been able to play through most of what's in the list so it's guess work and I might tweak it a bit. 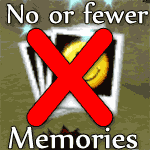 you've used my "no automatic memories" package: Download the new one for 1.26 (velocitygrass_no_automatic_memories_1_26.zip) and replace the old one with that. you've used your own package created with the tool: Start the tool and load your old package. Your old changes will be applied, but all new memories for Pets will remain checked by default after that, so uncheck those that you don't want and save your new package. Replace your old package with your new package. you've used my "only important memories" package: I'll re-do the only important memories one when I have time to take a closer look at the memories. However you can follow the same steps as above for your own packages to update it yourself if you'd rather not wait. Update 07/25/2011: Updated the ready-made flavors for patch 1.24. (The patch only brings a minor change related to the "Own a bar" lifetime wish.) The tool still works with the new patch. If you want to update your existing self-created memory mod make sure you have the latest version of the tool (see last update), start the tool, click load and select your old package, and then click save to save your updated package. Fixed switching of language so that unchecked boxes remain unchecked. Removed obsolete non-localized version of the tool to avoid confusion. Switched to new s3pi .dlls. Update 06/20/2011: Localizable version is available for testing. This one uses game strings and allows you to select your language (if it's supported by the game). A wedding is a pretty memorable thing. So is having a baby. But catching a great fish? Going shopping? Visiting the park - again?! This mod stops the memory scrapbook from filling up with useless memories that then have to be manually deleted to make place for custom memories or to keep savefiles small. 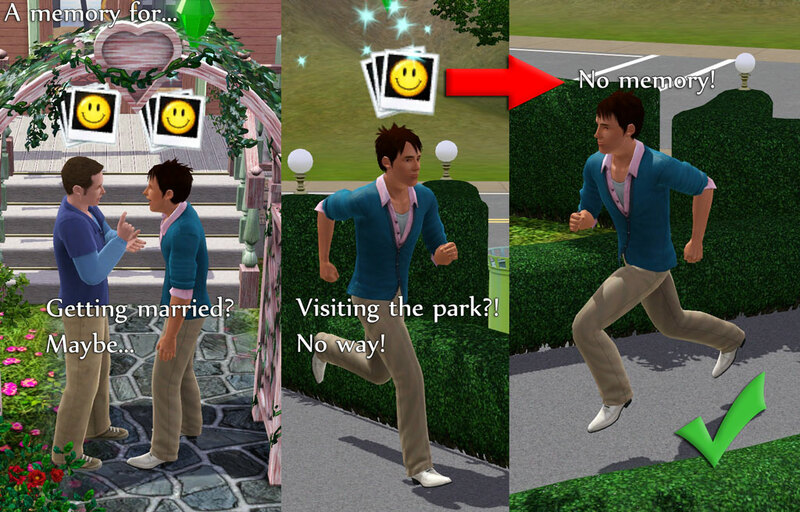 It can also be useful to prevent the memory popup from ruining screenshots of the important moments in your sim's life. Usage: Copy the package (downloaded or self-created with the tool) into your mod folder. Only use one package at a time! Make sure the version of the mod fits the patch level. Running The Sims 3 with an outdated version of this mod can cause errors with wishes (lifetime and normal) and GUI issues with the main tabs. Note: This mod modifies DreamsAndPromisesNodes (TGI: 0x0333406C-0x00000000-0x9A976C90ECC75C81) and will conflict with all other mods that do so. This mods sets the IsLifeEvent tags of individual dream nodes to nothing, so that the game doesn't consider them memories any more. Obviously, what is worth remembering is a highly subjective thing. Some people might want all social related memories, but none for the skills, others might want it the other way round. In order to accommodate this need, I created a little tool that allows you to uncheck the memories you don't want to be created automatically and save your own custom made memory mod package from the selection you made in the tool. Requirements: The tool requires .NET Framework 3.5 to run (the latest should work as well). It works for Windows and might work on other platforms with Mono, however I can't provide assistance for that. b) Start TS3_Memory_Modder.exe: The application it will attempt to read the Sims 3 installation directory from the registry and if it doesn't find it, it will prompt you for it. c) Uncheck the memories you don't want (if you only want few memories, it will be helpful to first uncheck all and then check the ones you want). Don't worry about the checkboxes for the header items; they are ignored. Additional option: You can load an existing package file that will restore which memories were checked and unchecked from the package. For your information: If you'd like to provide different ready-made flavors of memory mods made with this tool, please do so. It was the reason for making it. 1) No automatic memories. As the name suggests, no memories will be created automatically. If you want memories, you have to (and still can) create them manually. 2) Only important automatic memories. This package will allow automatic creation of a few selected important or memorable (and specifically rare) life events. Note: $sim can mean human or pet or both, depending on context. I do not plan on providing additional flavors myself. Please create them with the tool. General note: Just because an event is set to allow triggering of a memory doesn't necessarily always do so. The specific dream node needs to be active in the game as well for the sim. E.g. "Sibling is born" did not cause a memory in my tests, even though it was activated. Some memories also have a tuning that makes them appear only once every few days. If you want to go into more detail with modding this, you'll need to manually edit the .xml file as with any other tuning mod. The new version uses in-game strings for the memories and allows you to select from a list of game-supported languages. The tool GUI itself and the categories are not automatically translated, but can be. In the package you'll find an unfinished example for a German translation file. To switch to a different language simply select it in the drop-down box at the top and wait for the GUI to rebuild. Note: Untranslated values are displayed in English. This goes for the GUI as well as missing translations (e.g. the Mexican Spanish translations don't seem to exist for the memories). For Translators: Copy the file Strings_ENG_US_0x000f16b00ba8342f.txt into the same folder and name the copy the same as the string in the drop-down for your language. Change the string after the equal symbol to your translated string. (As an example see the first few strings in the German localization file.) You can test your translation immediately by restarting the tool (or simply switching to another language and back to yours). If you attach your translation in a comment, I can add it to the tool. Thanks to Sims MX for the Spanish (ES and MX) and French localization. Thanks to Crinrict for the German localization. Thanks to hotroxy777 and Wojtek for the Polish localization. TS3_Memory_Modder_Game_Strings.zip | Description: Tool to create your own custom memories mod. velocitygrass_no_automatic_memories.zip | Description: Package to turn off all automatic memories. For patch 1.63/1.66/1.67. velocitygrass_only_important_memories.zip | Description: Package to only have important memories be automatically created. For patch 1.63/1.66/1.67.